A Child’s Work goes inside classrooms around the globe to explore the stunningly original language of children in their role-playing and storytelling. Drawing from their own words, Paley examines how this natural mode of learning allows children to construct meaning in their worlds, meaning that carries through into their adult lives. Proof that play is the work of children, this compelling and enchanting book will inspire and instruct teachers and parents as well as point to a fundamental misdirection in today’s educational programs and strategies. "[A] richly detailed reminder of the enormously important role of imaginary play . 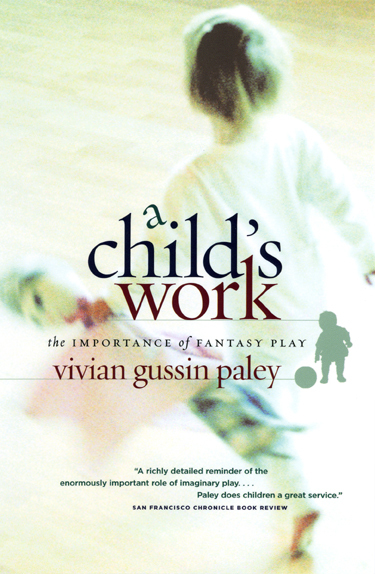 . . Paley does children a great service by reminding us of the enormous value of fantasy play." "This irresistible book is Vivian Gussin Paley at her very best. . . . The mixture in this book, of times and spaces old and new, is nothing strange; what’s different is the cold, critical eye she casts on the shape and purposes of early education today. . . . Her present insistence on the necessary relation between a rich variety of fantasy play and intellectual growth is represented as a hard-earned, precious insight, on which she will not negotiate."